With a stay at Ooike Hotel in Fujikawaguchiko, you'll be a 4-minute drive from Mt. Kachi Kachi Ropeway and 9 minutes from Itchiku Kubota Art Museum. Free self parking is available onsite. Located in Kutchan, this apartment is within a 15-minute drive of Niseko Mountain Resort Grand Hirafu and Lake Hangetsu Nature Park. Free self parking is available onsite. 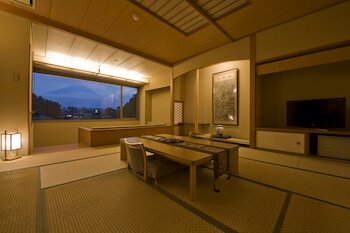 When you stay at paradise - Caters to Men in Matsudo, you'll be 12 minutes by car from Hondoji Temple. Featured amenities include a computer station, a 24-hour front desk, and luggage storage. With a stay at La Maison De David in Yufuin (Yufuin Onsen), you'll be steps from Ryukyu Islands and Kinrin Lake. The front desk is staffed during limited hours. Free self parking is available onsite.